← Mexican Food Made Simple – All things cheese! Unfortunately not much cooking has been going on in the Cookbook Neglectors kitchen this week. Having eaten a lot of rich food over the weekend it felt right to spend a few days eating healthily, and lets face it, no one wants to read (or write) a blog about grilled chicken and veg. I only cook and eat these delicious yet unhealthy meals for your reading entertainment you know, not because I’m greedy OK? Glad we got that all straightened out! The only problem with me resisting the temptation of eating food is that I then struggle to resist the temptation of buying books about food. Which is what part of this challenge was about, getting the best out of the cookbooks I already had and curbing my addiction to buying the damn things. But in my defence, out of all the addictions I could have, this is probably the least damaging. I also spent one evening this week making a wish list on Amazon, and the whole thing was just a list of cookbooks, how ridiculous is that? 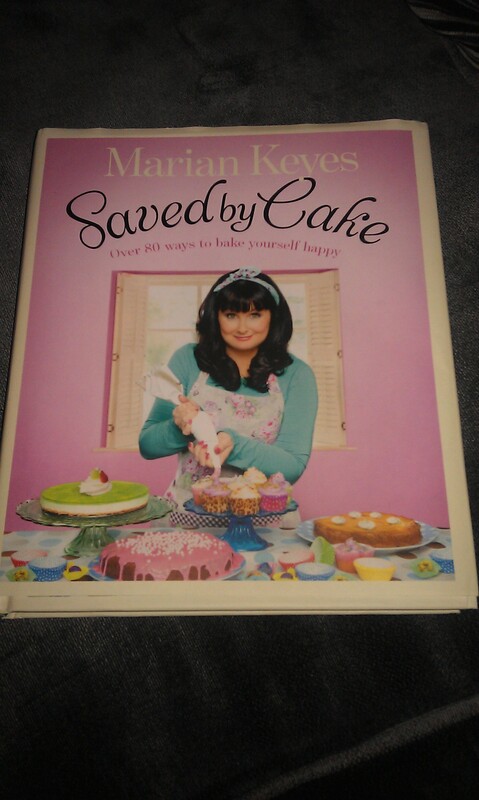 Anyway, when you see a cookbook by your favourite author (Marian Keyes), about your favourite thing (baking) and its bright pink, you become powerless to resist. I mean look at it, could you turn this down? Exactly, and if you could turn this down, you’re a stronger person then I will ever be. Anyway, I’m a big fan of Marian Keyes writing. While her fiction books may be ‘chick-lit’, they are nothing like the fluffy, predictable boy meets girl nonsense that’s given chick lit a bad name. Marian covers topics ranging from addiction, depression, marital breakdown and death, yet the writing is imbued with this fantastic sense of humour that has had me laughing like a mad woman in public (note: the writing is also at times heartbreaking so you may find yourself laughing and then crying in short succession. It’s not a good look on the bus). I was really surprised when I saw she’d written a cookbook, and even more surprised to find out that baking is what has helped her recover from what sounds like a horrendous depressive episode. In her own words, “To be perfectly blunt about it, my choice sometimes is: I can kill myself or I can make a dozen cupcakes. Right so, I’ll do the cupcakes and I can kill myself tomorrow”. It’s deep stuff, but I applaud her bravery in telling the world about what she is going through, especially as people suffering with mental health problems are so easily stigmatised. Its not a depressing cookbook though, far from it. The recipes are stuffed with her trademark humour and it almost feels like a friend has written the recipes down for you (example, on brownies: “FYI, and this can be our little secret, the square in the middle will be the most delicious of them all. I’m only saying, for when you’re dishing them out, if you wanted to single someone out for a treat – and who’s to say it can’t be you? – then the middle one is the very, very best”). When you read these quotes – or indeed her books – you must, absolutely must, read them with an Irish accent in your head otherwise the charm won’t fully be there. You have been warned! Food snobs may turn their nose up at cheesecakes and tarts being covered in edible glitter, but Marians recipes look beautiful covered in the stuff and I know I won’t be able to resist pimping my cakes when I cook from this book. It may not be sophisticated but you’re not trying to get a Michelin star so just relax and have fun with it, it’s only baking. There are a lot of amazing looking recipes in this book, and they are all easily achievable and look stunning. If you want to get into baking and /or want some more unusual treats (Snickers cheesecake/tiramisu macaroons anyone?) then this is a great place to start. And if I’ve not convinced you of her genius writing yet, pick up a copy of ‘Anyone Out There’ or ‘Brightest Star In The Sky’ and then tell me she’s not amazing. I’ll be cooking from ‘Saved By Cake’ at the weekend so I will update you on it then. While I’m here, I would also like to make an apology to the Mexican Vanilla Cheesecake from the last blog entry. After leaving it in the fridge overnight and then taking it to work, something magical happened to the cheesecake and it became much more to my taste and more dense, like an actual cheesecake! It seems I lack patience which clearly is an attribute needed when dealing with such things. Lesson learned, I must try and restrain myself next time I make a cheesecake and leave it for 24 hours before eating. I can tell you now that it won’t be easy, but for the sake of taste and decency I will have to try!